Malacañang officially awarded three Mindanawon women Gawad sa Manlilikha ng Bayan (GAMABA) last month, Oct. 24. Yakan weaver Ambalang Ausalin, Blaan ikat or tie-dye fabric weaver Yabing Masalon Dulo, and Blaan mat weaver Estelita Tumandan Bantilan now join the lineup of 17 National Living Treasures since the law’s institutionalization in 1992 (RA No. 7355). They were declared GAMABA by virtue of Presidential Proclamation 26 signed January last year. “Gawad sa Manlilikha ng Bayan or the National Living Treasures Award is the highest Presidential recognition given to individuals who excel in various indigenous arts, customs, and traditional practices which may include, but are not limited to, folk architecture, maritime transport, weaving, carving, performing arts, literature, graphic and plastic art, ornament, textile and fiber art, pottery, and other artistic expressions of traditional culture,” says the National Commission for Culture and the Arts (NCCA) on its website. Ausalin, 75, hails from Lamitan, Basilan and is a known magtetenun or weaver having served two generations of the royal family. 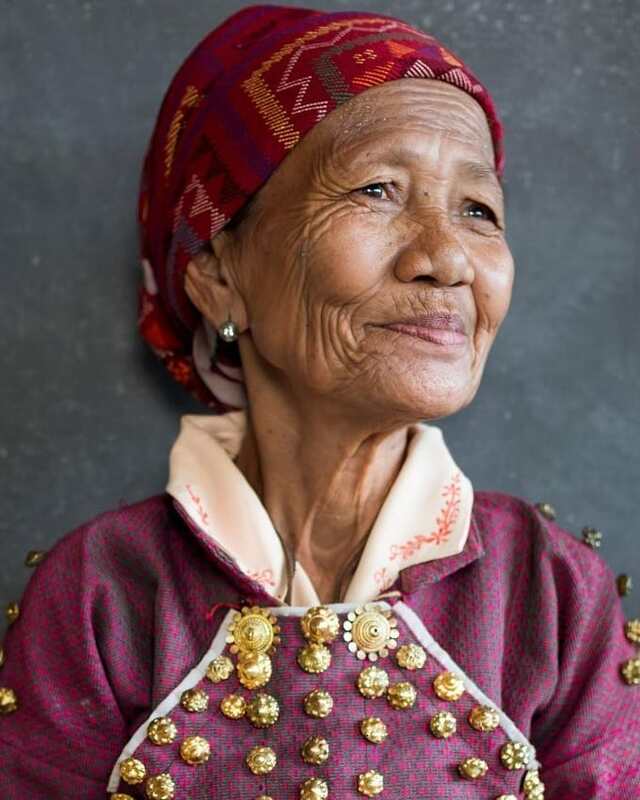 According to the NCCA, she was the weaver of traditional attires and costumes for the royalties and the community. She mastered two of the most intricately designed textiles of the Yakans—seputangan and sinaluan. Bantilan, 78, is from Sarangani and has been weaving igem or mats since she was six. At 15, she has mastered the craft of mat-making using naturally dyed romblon leaves. Dulo, now 104 years old, on the other hand, lives in Polomolok, South Cotabato. At 14, she has weaved two masterpieces of tabih or dyed abaka—one is displayed at the National Museum, the other is kept in her possession. The award logo is a representation of the human form used in traditional cloth. Below the logo is the phrase “Manlilikha ng Bayan” written in Baybayin. Photo courtesy of the Official Gazette. “The main objective of the award is to honor and support traditional folk artists and to see to it that their skills and crafts are preserved,” according to the Official Gazette. 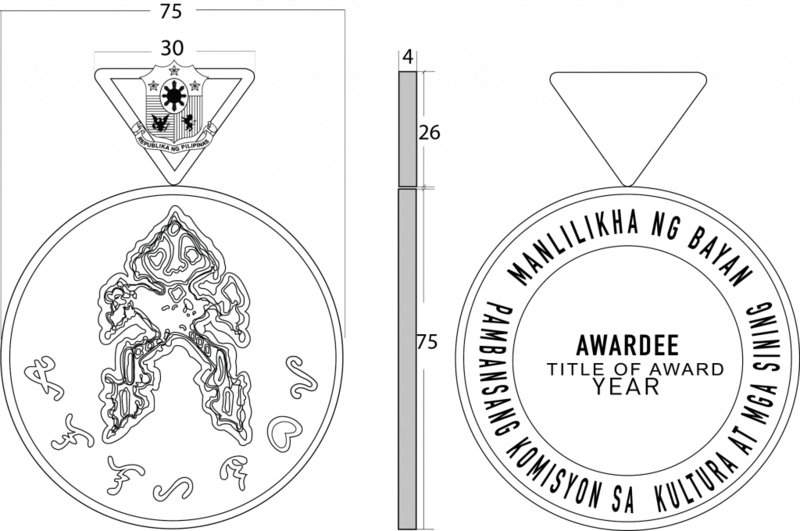 The awardee receives a specially designed medallion or plaque, with a duplicate set that should be donated and displayed to a provincial museum or the largest cultural center in the awardee’s community. The awardee is granted a maximum cumulative amount of P750,000 medical and hospitalization benefits as well as funeral assistance similar to those received by the National Artists.